Other Products: White Cardstock. Perfect pearl-silver, pollens. Instructions: Card final size 6"x6". Adhere Sweet Peony pattern paper which is 1/8" smaller than the base size and distress the edges. Cut two Sweetheart Border die from white cardstock. Cut two decorative medallions on white cardstock and the outline with patterned paper. Adhere it on the back base of the card as shown. 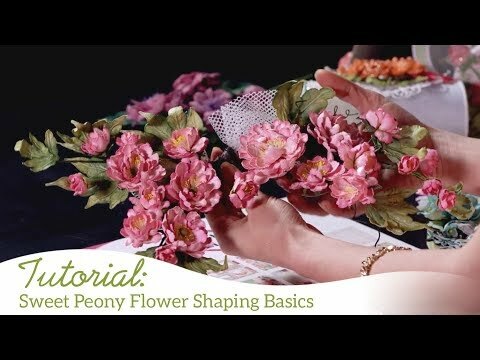 Now create peony flowers, leaves and some tiny flowers. 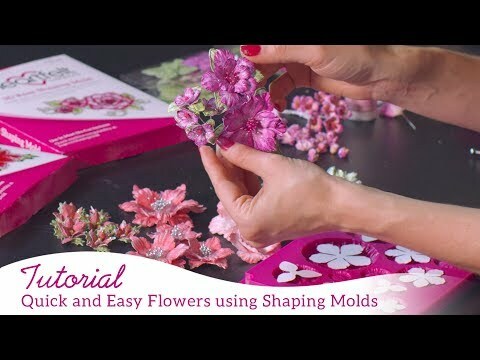 Stamp peony flower with Rose Madder Archival ink and cut them with matching die and color them with the same ink and shape them with basic shaping mold and arrange them. Now stamp some leaves with Leaf Green Archival ink and cut them with matching die and shape them with the Deluxe Flower Shaping tool kit and then randomly spray gold color using perfect pearl. For small tiny flower bunches stamp small peony flower with Red Carnation Archival ink and cut them with matching die and color them with Sunflower Archival ink, and then add Crystal Clear powder. And arrange all these as seen on the picture. Stamp the sentiment from Young at Heart Cling stamp set "Best Wishes" with Archival ink-Plum and cut them with matching die. Fussy cut postage image from the designer pattern paper and arrangement it with the flowers.